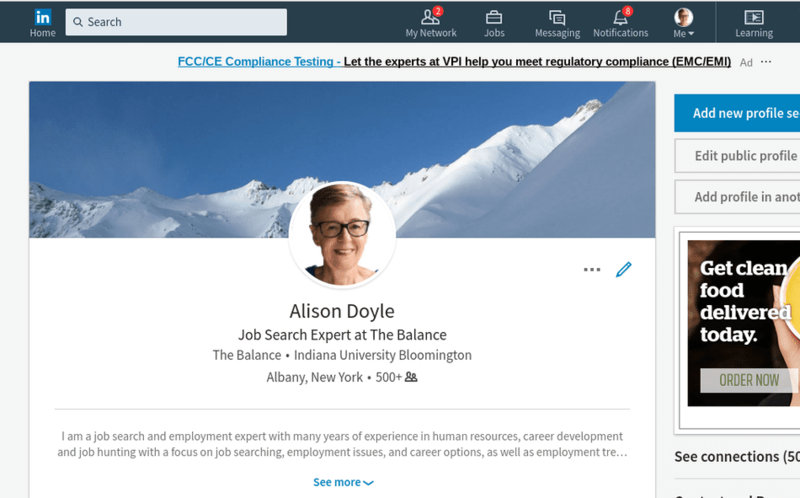 When you're looking for a new job or positioning yourself for career growth, it's important to have an online presence where you can showcase your skills and experience. Your online professional profiles will also help you connect with contacts who can expedite your job search, and assist you with moving up the career ladder. Here are some of the websites where you should create an online profile. Do be sure to actively manage your profiles so they are up-to-date. Employers and contacts want to see current information. Also, be sure to keep your professional life separate from your personal one. When you have multiple accounts it can be easy to mix them up. Think twice before you post to be sure everything is being posted to the right place. When you're consistent across sites, using the same themes and photos, you will be able to create a strong personal—and professional—brand. Review these examples of profiles to get ideas for building your own professional presence on social media and the internet. LinkedIn is "the" site for professional networking. Recruiters actively use it to source candidates and it's the best resource for building and managing your career network. Update your profile frequently, include your employment history, education, skills, and examples of projects you've worked on. Engage with other users, and spend time growing your network. The more connections you have, the greater your visibility. Creating a Facebook page is a way to differentiate the professional from the personal you. Set up a page to share your expertise, industry news, and current events with others. Keep your family, friends, and photos on your personal page and be careful about the privacy settings, so you don't inadvertently share too much information with employers. Twitter is a terrific way to establish yourself as an expert in your industry. Tweet about what's happening in your industry—news, events, and advice. Also, be sure to retweet advice from industry leaders. Take the time to follow (and retweet) companies you're interested in. You may be able to get new job postings before they are listed elsewhere online. Pinterest is a great way to impress your connections and prospective employers. Pinterest shows hiring managers that you are on top of and engaged with what's happening online and you can highlight your resume and your professional work. Once you have set up Pinterest, you can add a link to your page from your LinkedIn and other online profiles, websites, and blogs. A blog or personal website that is related to your career interests is a good place to highlight your expertise and an ideal way to feature your credentials. You can provide information on what you have to offer an employer, link to your online social profiles, and share your contact details with prospective employers and networking contacts. Do be careful to keep it relevant to your career interests, if you're writing it while job searching. If you have a personal website, portfolio, or blog, you can use your "About Me" page to engage readers, promote your professional brand, and sell your skills to prospective clients and employers. One way to increase your visibility is to build a professional brand that is consistent across all the social media platforms you use. For example, you can use the same photo on all your profiles. You can also create a branding statement and use some or all of it, so you're sending the same pitch or message, on your social pages. Remember that employers will probably be looking at all the information you have online. Take the time to periodically check all the information you have posted to make sure that it's acceptable for professional viewing, so you can make sure you don't get any unpleasant surprises during the hiring process.